In this solo dining adventure, Gary tries the burger at The Burger Garage with the hope that he can find an excellent burger close to home. 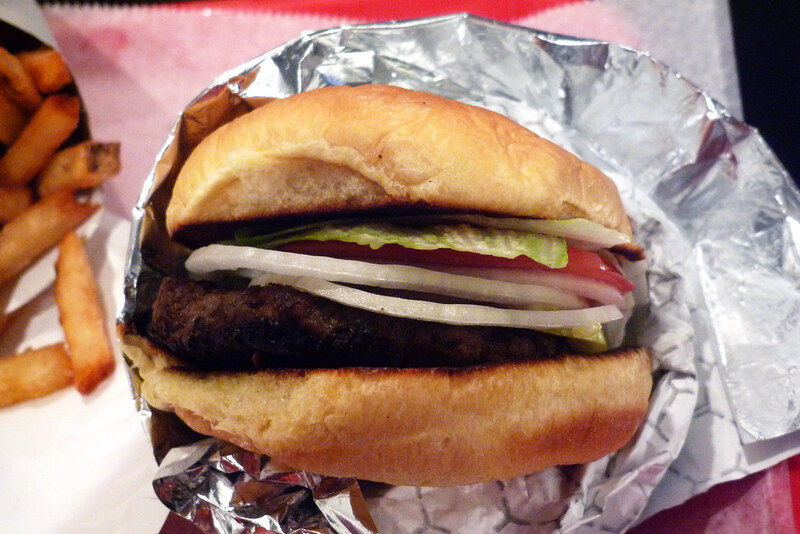 There are a lot of cuisines that Astoria and nearby LIC do well – Greek food in Astoria rates highly – but the one thing I’ve been clamoring for was an exceptional burger joint to open. It doesn’t have to be Shake Shack good but it should be something that makes me think “hey, I’ll walk or hop on my bike over there for a burger!” There are some bars with a decent to good burger but in my five-plus years here, I hadn’t found an amazing one. 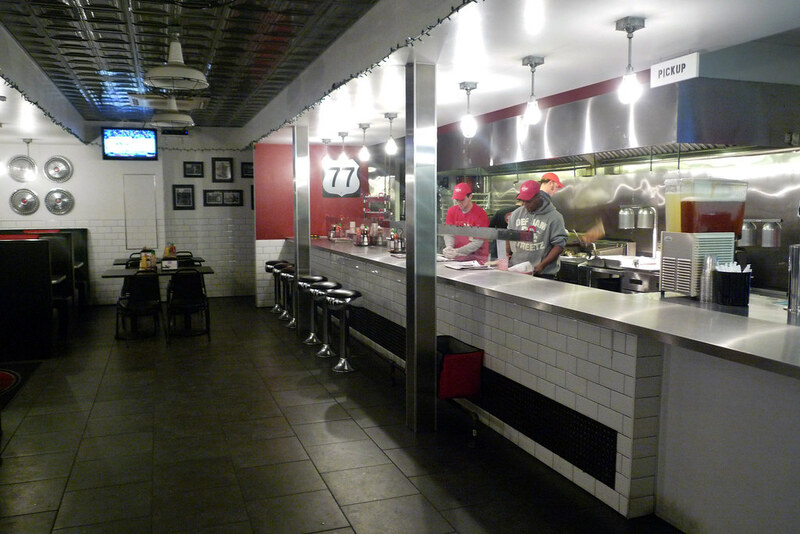 Then The Burger Garage opened this past summer in LIC and I was hopeful again. It seemed like it had a good pedigree with the owners’ family having opened the famous original Palm restaurant and they sounded like they knew what a good burger should be. My enthusiasm waned as I compiled a Good News/Bad News for Eater and every positive review seemingly came from someone shilling hard for them. Sure, it’s possible that they really loved the burgers here but it sounded way too gushy considering the generally okay impressions I’d seen from most. That doesn’t mean it’s bad, just that it’s probably not a Shake Shack in Queens. I’d also heard plenty of complimentary things about the place from fellow burger fan Won so we, along with his wife Cindy (who also holds the distinction of being one of my oldest friends), decided to come here for dinner so I could finally try the burger. I got the single burger, a 4 oz patty with lettuce, tomato, onion, and pickles. It’s assembled nicely and then wrapped tightly in foiled paper to prevent a messy eating experience. The char on the patty was a good one but the flavor just wasn’t hitting the spot for me. It wasn’t exactly bland but it wasn’t seasoned as well as it could have been. Just a dash of salt in the ground beef or even on the burger when it hit the griddle would have made all the difference to me. It didn’t help that the patty was a bit on the dry side. In total, it was an okay burger. 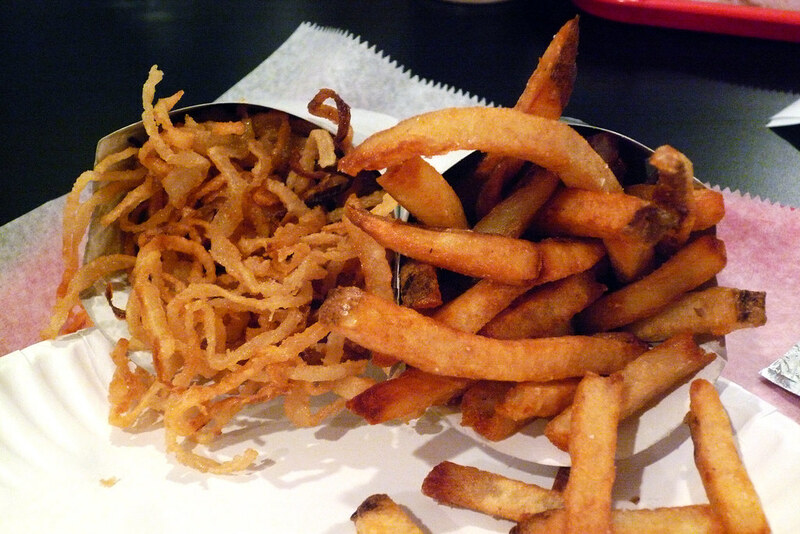 At least the fries and onion strings were tasty though somewhat greasier than I would prefer. But they had a decent amount of seasoning that only required the tiniest dash of salt from the shaker. And they were all very crispy which is all I really ask for in my fried sides. Before I get any final verdict on The Burger Garage, I have to address the one point that hung heavily in the air during our visit. Namely, the absolutely poor job of ventilation here. When we arrived, they were in the midst of firing off a big order, one likely for catering and that caused our order to be put off for 20 minutes, which was annoying but tolerable. What was intolerable, at least for me, was how much of the meat vapors left the griddle area and wafted all the way over the booths. I was smelling burgers the entire time I was waiting for my order, when I was eating my burger, when I rode the subway home, and in my apartment. All my clothing reeked of cooked meat vapors. Perhaps that’s part of the classic burger eatery approach the owners were going for but it was a complete turn off for me. Complaints about the ventilation aside, I will say they make a decent burger; decent but an altogether unmemorable one. While they were busy trying to nail down the concept and look of the place, they should have spent more time working on making a more exceptional burger. As it stands, I can’t recommend visiting from outside of Queens and, honestly, I can’t see myself coming here when there are better options just a few stops away in Manhattan. I can only hope the next entrant in the Astoria/LIC burger arena does a better job. The Burger Garage. 25-36 Jackson Avenue, Long Island City, NY 11101. [Show/Hide Map] (718) 392-0424.